Dr Mohammad Nurunnabi examines the factors that affect the implementation of International Financial Reporting Standards (IFRS) in developing countries and answers these specific research questions: - What is the relative impact of accounting regulatory frameworks and politico-institutional factors on the implementation of IFRS in developing countries? - How do cultural factors affect said implementation? 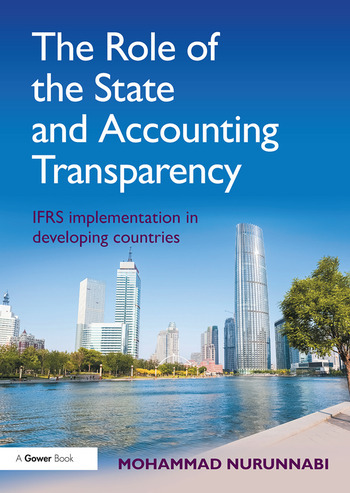 - How does a study of implementing IFRS help to build an understanding of a theory of the role of the state in accounting change in developing countries? This follows a mixed methodology approach, in which interviews are conducted, IFRS-related enforcement documents and annual reports are evaluated. More than 138 countries have adopted IFRS, yet the International Accounting Standards Board (IASB) does not provide an implementation index. Financial reporting varies by country, even within the area of the world that has apparently adopted IFRS and Nurunnabi offers an important viewpoint that considers the issues of IFRS implementation from various perspectives. This is an invaluable resource for Undergraduate, Masters and PhD students, policy makers (at local, regional and international level) namely the IASB, World Bank, IMF, practitioners and users, giving them the necessary insight into the financial reporting environment and the state’s attitude towards accounting transparency. Most importantly, this book contributes to military and democratic political regimes and the Max Weberian view of the theory of the role of the state’s attitude towards accounting transparency. Mohammad Nurunnabi FHEA FRSA FAIA(Acad) is an Associate Professor in Accounting and Chair of the Department of Accounting at Prince Sultan University, Riyadh, Saudi Arabia. He holds a PhD in Accounting (International Financial Reporting Standards – IFRS) with outright pass (no corrections) from the University of Edinburgh, UK. Previously he was a Senior Lecturer in Accounting and Research Leader in the Accounting Group at the University of East London, UK. He also taught in University of Bedfordshire, UK and Edge Hill University, UK. He teaches Advanced Accounting, Accounting Theory, Auditing and Management Accounting. He is an Editorial Member of eight journals and reviewer of 41 journals.